Coot Cottage is a pretty wooden cottage overlooking Broads Haven Marina. The large living/dining room offers wonderful views over the water and has two comfortable leather sofas, TV/DVD, CD/Radio and dining table. 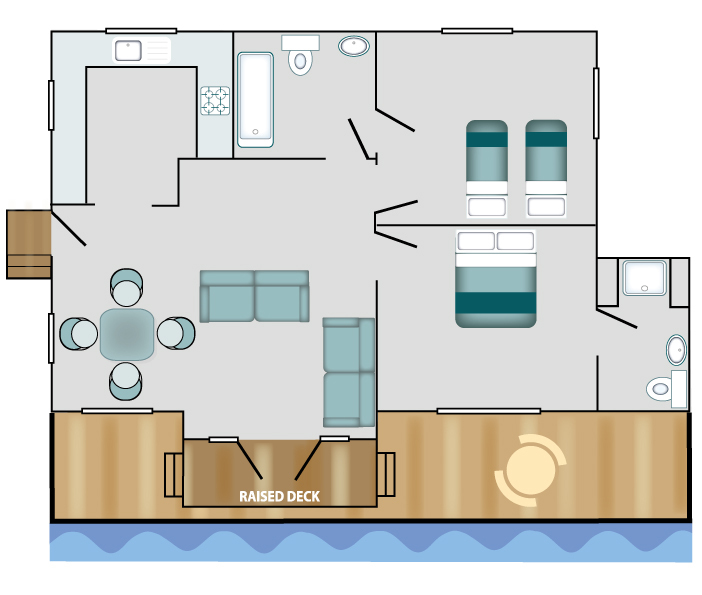 There is direct access via the French doors to your own private deck, with table and chairs. The cottage sleeps 4 guests in two bedrooms, the en-suite master bedroom features marina views and a super king sized bed, which may be changed to two single beds on request. The second bedroom has twin beds and direct access to the family bathroom which includes a bath with shower over. The separate kitchen includes a dishwasher and is fully equipped with everything you may need for your stay. An iron, ironing board, high chair and travel cot are all available within the property, we just request that you bring your own bedding for the travel cot. Outside you will find a mooring for one boat. Parking for two cars is available approximately 25m from the property. Free WiFi is available for the duration of your stay and guests receive 25% off day boat hire with Herbert Woods.